1) Bring a large pot of salted water to boil, and cook pasta according to package directions. Drain and set aside. 2) While waiting for the water to boil, make the meatballs. In a medium bowl combine Beyond Burgers, breadcrumbs, egg or egg alternative, 1/4 cup of the cheese and chili pepper flakes (if using). Season with salt and pepper. Mix together with hands until thoroughly combined. Using a tablespoon cookie scoop (or just a spoon and your hands), scoop out the meatballs and shape into a ball. Place on a sheet of parchment paper and continue shaping meatballs until there is no more filling left. 3) In a large skillet over medium high heat, add the olive oil. Cook the meatballs, about 3-4 minutes per side or until browned. Flip to the other side and cook for another 3-4 minutes, or until browned. Remove meatballs from the pan and set aside on a plate. 4) Lower the heat on the skillet to medium low. Add the butter (or vegan butter), and allow to slowly melt, stirring occasionally. It should turn brown and be foamy. Once browned, add the sage leaves and allow to fry for a few minutes or until crispy. Remove the sage leaves. 5) Add the vegetable broth and the rest of the cheese. Stir until melted, and season to taste with salt and pepper. Stir in the cooked pasta, tossing to coat. 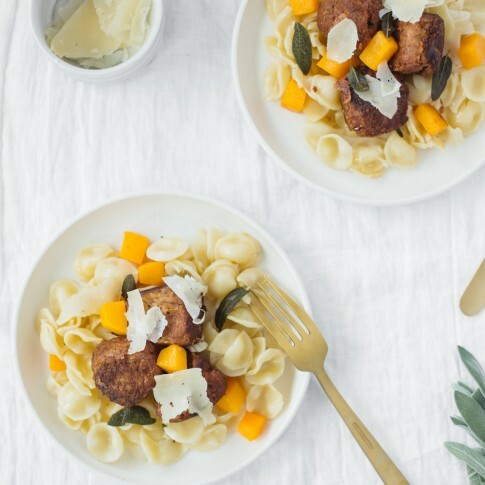 Top with roasted squash, meatballs, crispy sage leaves, and more parmesan to serve. Enjoy!